Nope still just the rich northern Tehranis. Hahaha, Reza, SZ, Galloway, et al are all beginning to sound like the Iraqi information minister who, even as US bombs were landing right near his studio, continued to insist on camera that the rumors of a US victory are lies concocted in Hollywood! There have been massive rallies with hundreds of thousands of demonstrators on the streets of many cities in Iran for the last few days. Many have been killed and injured, yet the BBC has hardly covered this in their news. It is well known that as Iran's biggest trading partner, European countries have been tacitly supporting the terrorist regime of the Islamic Republic. However, this regime's days are numbered, and it seems that the BBC is still insisting on backing the wrong horse. The current situation on the ground is yet to be fully seen and understood by those of us that live abroad. The movement is without a well defined leadership, and many forces are operating in the streets of Iran. Additionally, the Western powers and analysts are totally dumbfounded and don’t realize what fuels the uprising and gives it direction. Potkin, out of interest, what's the source for that picture? That would be very useful to me, cheers. These are not Basiji. They are uniformed NCO police officers. Still a good sign! This is so like 1953 when rent-a-mob was called out into the streets by the British and Americans to dislodge the elected regime of Mossadegh. I admit the Americans are clever with the themes used in this color counter-revolution (green for Islam, ya hussein, yazid etc) but Ahmadi is a man of steel - he will just dismiss any rioting as the actions of losers and thugs. Mr Hashemi is playing his final ace - after this, its all over for him and his family. 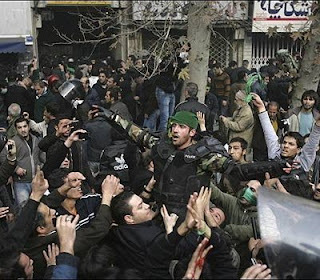 You really are stupid if you think that the Islamic Republic is going to collapse because of these hooligans on the streets. Yes, most of these kids are just that, kids who are upper middle class, and who are upset with the current situation in Iran when it comes to their so called freedoms. You just don't know what you're talking about. This protest is not a widespread discontent with the government, instead its a limited discontent among the upper middle class in Tehran who are more westernized when compared to the general populace. How many years have you been saying with your dissident lot that its over? How many years have you been saying that Iran is on its last legs? I am willing to bet you right here right now, $1,000 to your favorite charity that Iran's government will be around for as long as we live, and I am 28. People in the west, like you and Potkin, and all the other douche bags on CNN and foxnews are making this news sensational. When the people in China were rebelling against the government, and about 400 of them were killed, nobody said anything about the government collapsing. Simply put, you're an idiot. Once the police and army turn against the regime it is as good as over.... I hope that happens very soon for the sake of a very brave people. Don't you see how isolated and terrified your paymasters are? Even the Russians are abandoning them. Just a few hours ago, the Russian foreign ministry released a statement saying "we are saddened that the Iranian people think Russia is behind their repression -- Russia doesn't have a hand in it, etc." You know what that means? It means the Russians, the IRI's biggest international supporters, are beginning to sense how untenable the regime's position is. Therefore, they are hedging their bets and trying to improve their image among the general populace in case the regime collapses. That should be a telling sign to anyone with a modicum of intelligence. But then again not much can be expected from the son of an Irish whore. Call that a revolution, or do you call it a riot? Against ther iraq war in the US. The silent majority will put an end to this, don't worry. Have enough on your plate with Iraq and Afghanistan! Who was talking about Tiananmen? I was talking about the recent uprising by the Muslim Chinese in the West of China. You are delusional. The TRUTH is that the government is being very lenient against these rich thugs. After Larijani's warning today, they will be reprimanded if they dare come out again. What you don't understand is Iran is not like you want it to be, its an Islamic nation in which the majority of the people support the government. Sure there are points of contention among people in which the government can improve, but for the most part, people support their government. Like I said, let's make the bet, I will own up to it if I lose. But something tells me that you won't and you'll just puss out like all you dissident lot always have anyway. And Anon, nice of you to address the post I made, you are very mature, it shows. China is even more powerful now than since Tiananmen, you moron. Now they hold over a trillion in US treasuries and have been growing at a rate 7% or more every year. The same cannot be said of Iran. And you didn't address the point about the Russian Foreign Ministry's latest statement, you son of a whore. FREE IRAN! DEATH TO THE DICTATORS!